Today and tomorrow’s highs will reach the mid to upper 40s under mostly sunny skies. Prefer more sun? Today is your day. Don’t mind the few clouds that arrive early tomorrow, as they don’t bring the weekend rain until late Friday night. Saturday is cloudy and damp with spotty sprinkles, but rather dry compared to Sunday’s soaker. Winds pick up, allowing at least 1 inch of rain to fall Saturday night and Sunday morning. Temperatures spike into the mid and upper 50s. Rain ends by Sunday evening, but a cold wind replaces any mild air by Monday morning, keeping wind chills in the 20s for much of next week. Flurry chances are increasing for Tuesday with a weak system nearby as the cold weather persists through next Friday. In spite of the afternoon clouds, this was not a bad day for the boroughs as temperatures were 4 to 7 degrees above average. The quiet weather continues for tonight, but increasing clouds are in the forecast for Friday with a slight chance of a few showers Friday night into Saturday. Another, more significant round of rain and gusty winds moves in late Saturday into Sunday with periods of rain that may be heavy at times. Potential rainfall amounts of an inch are in the forecast by Sunday Night. Get ready for another blast of cold air with highs in the 30s early next. The entire weekend won’t be a washout: just Sunday gets that title. Today is our last dry day until Monday. Sun plays hide and seek with the clouds through the middle of the day today. Temperatures will be just a mild as yesterday, in the 40s. Tomorrow starts with a quick shower before dawn, and then stays just plain cloudy and mild until another brief shower gets us wet later in the afternoon. The steady rain arrives after midnight to start Sunday on a soggy note. Winds will gust to 25 mph all morning, and rainfall approaches an inch by noon. The heaviest of the rain will be on Sunday morning. Total rain may approach 2 inches with higher amounts falling to our north over our reservoirs (their levels are still slightly below average). The showers taper Sunday evening with gusty breezes to push out the mild 55 degree air. Wind chills will be in the 20s most of next week while sunshine dominates the forecast through next Friday. There is no guarantee of any blizzard next weekend, but given easy access to one-hard-to-find raw weather model data, dreamers can dream. “18z GFS” has been trending for 12 hours now on twitter thanks to weather weenies wishcasting a storm. There is little to no confidence in any weather event that doesn’t last from run-to-run, and only shows up on one deterministic prognostication (read: weather model) of many. After a day of sunshine, gusty winds and temperatures 3 to 4 degrees above average, we’ll have a brief push of colder air for Wednesday and Thursday. Also there is a chance of rain / snow showers late Tuesday and Tuesday evening as an Alberta Clipper crosses the region. Snow accumulation is forecasted for about .2 of an inch and ending after 9PM (Sorry Snow Lovers). High pressure builds in behind the clipper so temperatures will rise late this week. Wednesday was a day of sunshine, gusty winds and temperatures 4 to 6 degrees below average for this time of the year. We have a slight chance of snow flurries/snow showers prior to Thursday’s early morning commute. A dusting or less can be expected. The superfine snow that’s leaving a dusting on cars will be gone once the sun comes out, by 9-10am. This afternoon will have clear skies and highs in the mid 30s. Tonight stays above the freezing mark. Tomorrow brings sunshine to start, then afternoon clouds will lock in tomorrow’s warmth of near 50 degrees. Saturday begins very wet, with heavy downpours similar to last Sunday. Skies clear by Saturday afternoon and temperatures drop into the 20s and 30s for most of next week. Highs today will reach the low 50s under partly sunny skies. Clouds roll in this afternoon, leading to light sprinkles during the evening rush. Steady rain begins closer to midnight as temperatures stay well above freezing. Tomorrow begins soggy, but the rain will be over by early afternoon, and some clearing if even possible for a few sunny breaks before dusk. Sunday is much colder with clouds and flurries that linger into Monday. Monday and Tuesday morning’s wakeup wind chill will be 9°. Gusts to 35mph plus a fresh Arctic air mass will help keep things chilly all next week. The more active pattern long range continues into next weekend. Not a bad way to end the work and school week with highs 9 to 11 degrees above average. Low pressure is driving rain north so keep an umbrella handy tonight through the early morning hours of Saturday. Periods of rain with a few pockets of moderate rain during the late overnight hours. Potential rainfall amounts from ½ inch to ¾ inch by Saturday morning. Slow clearing and breezy weather builds in Saturday afternoon through Saturday night. Cold weather returns by Sunday. About 7 different events need to happen, in sequence, at the right times, in order to get pummeled by a good thump of snow on Friday night and Saturday. If one or two things of those 7 events don’t occur, then we’ll get a glancing blow, and no snow. There’s a lot of uncertainty regarding Saturday, and these questions will remain until Wednesday. Wednesday morning will be the earliest time that any forecast accumulations will have a chance of being accurate. Further confidence will build on Thursday. Because, right now, given the long-timeline, our snowfall forecast accumulation range is currently anywhere from a half inch to two feet by Sunday morning. You may think that sounds ridiculous, but I say it’s even more ridiculous to believe a guarantee of a historic snowstorm that’s five and a half days away. The energy that is Saturday’s “storm” is currently a disorganized a weather system 1,500 miles west of San Francisco. Patience. Imminently, there’s bitter cold coming tomorrow. The leading edge of that cold air is helping to squeeze out this morning’s flurries. Another round of flurries occur this evening. Winds have already gust to 35mph, and could gust to as high as 45mph tonight. That would mean subzero wind chills for Tuesday morning’s commute. Wednesday and Thursday and quiet and cool with sunshine. Clouds will keep it chilly on Friday. Next update will arrive, as usual, tomorrow morning before 8am. Winter has returned to the borough! Daytime highs have fallen from 52 on Saturday, 42 on Sunday and 31 for today. Unfortunately, peak wind gust ranged from 35 mph for Central Park to 39 mph for LaGuardia and JFK, made it feel like the single digits and the teens. This trend will continue for another 24 to 36 hours. There is the potential for a coastal storm early this weekend. We’ll keep you updated. if the city gets a few flakes, or a few feet. Another bitterly cold day for the boroughs with temperatures 7 to 10 degrees below average. Gusty winds of 34 mph (at Central Park), 43 mph (at LaGuardia) and 44 mph (at JFK) made it feel like the single digits and teens under a mostly sunny sky thanks to high pressure over the Ohio Valley. The high will move east over the next 24 hours so we should remain dry. The next best chance of precipitation could bring the first significant snowfall of the winter season late Friday and Saturday. The winds have subsided and the temperatures were as much as 2 degrees above average. High pressure is currently approaching the Ohio Valley. Ahead of the high is a band of snow showers that will being a chance of flurries tonight. At this time, I’m more concerned for coastal flooding and beach erosion due to 40 to 50 mph winds. likely scenario is 4-9” in the Bronx; however, that is trending higher. set up over a small area, in the shape of a curved band on map, hence the name. 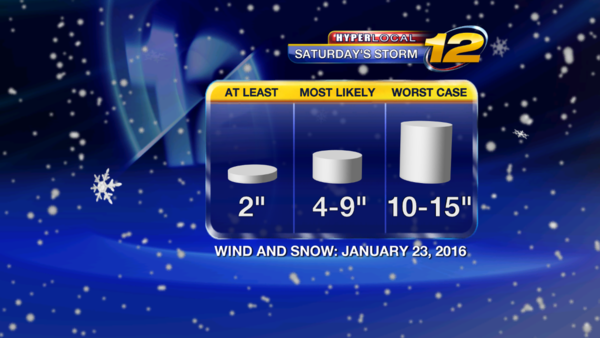 midnight will be the worst of the snow storm, and the worst of the flooding. noon. The wind will still be gusting to 20-25mph all afternoon. The hurricane hunters are being deployed on missions to fly over the blizzard tonight and tomorrow. That’s how big and powerful this storm is. Global and local weather models all agree on the storm’s position, but still differ on its forward speed. Moderate coastal flooding of 2.5-4 feet above high tide is a certainty, hence the coastal flood warning. Major coastal flooding is likely, but only at the lowest areas along the shore, tomorrow night beginning around 7pm in Brooklyn and 11pm in the Bronx. 1-2 feet of seawater above ground level is considered major. This is not Sandy, nowhere near its power; however, tomorrow’s flooding is more comparable to the 1992 Nor’easter that turned the Manhattan Beach neighborhood in Brooklyn into its own island. This is all due to persistent wind direction with gusts to 55mph and the full moon. Regarding snow: this storm can still be called a blizzard is only 1 or 2 inches of snow falls. A blizzard only refers to the wind and reduced visibility, making travel hazardous. Tomorrow’s storm puts at least 3 inches of snow on the ground; however, another consideration is the surprise that a ocean-fueled storm can dish out hours after the first flakes fall: banding. The “banding” that I explained yesterday is already appearing on the shorter range high-resolution charts. Banding is not something a longer range global model can see, which is why it’s only appearing now. Those bands could double snow totals in certain areas. The start time tomorrow is still early to mid-morning (don’t be surprised if you wake up to just cloudy skies tomorrow). The wind begins early in the day. The snow tomorrow evening will become very heavy, after the storm strengthens in the ocean. Then, as the system pulls away Saturday night, the heaviest of the snow ends, and we’re left with 4-9 inches in the Bronx, and roughly 6-10 in Brooklyn. Could accumulations go as high as a foot in Coney Island? Absolutely. Once the snow begins falling tomorrow, final accumulations will become crystal clear. Now that the Blizzard of 2016 has come to an end, we must all be mindful of refreeze as overnight lows fall to the 20s. The freeze-thaw cycle will continue for as highs reach the 30s and 40s for the next 5 to 7 days. We even have chance of showers Thursday afternoon and Thursday evening. It’s going to take some time for the 26 to 31 inches of snow to melt. Likely not. While the track is similar, the bigger picture is different for Thursday night into Friday morning. This past weekend’s blizzard was blocked from zipping off into the Atlantic, holding it in place for several hours, therefore dumping snow on us. In three days, the storm offshore will have a clear path to sea, just keeping it away from the city. Maybe points East of here get some accumulation by Friday morning, but the event just keeps us cloudy as of today. Partly to mostly sunny skies abound through Thursday morning, with highs around average in the upper 30s. The weekend turns much milder, likely in the upper 40s by Sunday. Daytime highs for Central Park, LaGuardia and JFK were 39, 38 and 36 degrees. We saw several location across the boroughs with temperatures reaching the low 40s which really enhances snow and ice melt. Overnight lows are forecasted for the upper 20s and low 30s with warming temperatures after midnight. That said, be on guard for areas of black ice. There is also a chance of patchy areas of fog by the Tuesday morning commute. Later in the week (late Thursday – Friday) we may get clipped by another coastal storm. More details over the next 24 to 36 hours. However, it does not look like it will be an issue at this time. There’s no more threat of any storm on Thursday night into Friday. The system takes a wide right out to sea. Today turns much milder, with some neighborhoods in the 40s before daybreak this morning. That southwest wind today will help keep highs in the 40s as clouds return by midday. A light shower of all liquid briefly returns this evening. Highs should remain above freezing all night in the boroughs. Black ice returns in the next few days with a sharp cold returning tomorrow afternoon with the sunshine. Lows will be well into the 20s by Thursday morning, reducing the effectiveness of plain salt in the coldest spots. (Typically stops working around 20°; useless at 10°) Other chlorides like potassium and calcium would prevent black ice Thursday, Friday and Saturday. Saturday afternoon begins a warming trend that could take us into the 50s on Monday. Mother Nature has provided for great snow and ice melt thanks to highs that were 7 to 10 degrees above average for January 26th. The trend of well above average temperatures will continue through the weekend and middle of next week with the exception of Thursday and Friday as a clipper system cross the Great Lakes region and brings a push of colder air as well as a slight chance of snow flurries and or snow showers. The snow and ice melt is coming along well. If you remember, Central Park recorded roughly 27 inches of snowfall from Saturday’s storm. Since then, daytime high temperatures have been above freezing by as much as 16 degrees so far this week. As a result, we have gone from a 27 inch snow depth to a 9 inch snow depth with the greatest reduction between Sunday and Monday. About 8 inches in a 24 hour period! With daytime highs forecasted for the mid-30s on Friday to the low 50s by Monday, most locations may see more ground than snow by the middle of next week. Be aware of refreezing during the next few overnight. After a day with clouds and the threat of snow and rain showers, we’ll transition to a rather pleasant weather pattern as high pressure moves in from the west for the weekend. A mostly clear sky, diminishing winds and lows from the mid to upper 20s are in the forecast for Friday night. Thanks to high pressure, we’ll benefit from a southerly winds pattern that will drive our temperatures to the 40s and 50s Sunday through Wednesday of next week. The next few days offer wild variations in the weather: today started sunny and mild but turns warmer with light rain by midday. (54 degrees on the first day of February!) Tonight is windy, colder and dry. Tomorrow is colder with crystal clear skies all day, but the afternoon has a notable dry chill. Wednesday jumps 15 degrees with warm air all day. Steady, moderate rain returns Wednesday afternoon. Thursday and Friday are the coldest all week. While this week is relatively quiet without any large storm threats (other than Wednesday’s rain), next week appears very active. Winter’s not over until Sunday, March 20th. The month of February is starting off with temperatures 17 to 21 degrees above average along with light showers as we approach Monday evening. High pressure, currently over Illinois will move eastward overnight. This high will being us a mostly sunny sky for Tuesday along with highs from the upper 40s to low 50s. On the heels of the high is a storm system forecasted to bring wind and rain that may be heavy at times to on Wednesday. Fair and cooler weather is in the forecast for the remainder of the work and school week. Groundhog Day is Tuesday. Will the Groundhog forecast an early spring or six more weeks of winter? The groundhog did not see its shadow this morning. According to folklore, we can expect an early start to spring. It certainly felt like spring today as high pressure dominated the region. A sunshine filled sky and temperatures 11 degrees above average was a great way to spend Groundhog Day. Unfortunately, our weather goes downhill from here as a storm system over the plains draws moisture from the Gulf of Mexico which we’ll see along with gusty winds Wednesday. With that in mind, it’s time to trade in the sunglasses for and umbrella. Rainfall amounts are estimated from .50 to .75 inches by late Wednesday night. This morning’s rain starts lightly, but gradually picks up to a moderate intensity this afternoon. A brief burst of heavy rain arrives around 4pm with a possible rumble of thunder. Flooding won’t be an issue in the concrete jungle since all the snow has already melted (that’s not the case west of boroughs). After the inch of rain wraps up tonight, our months-long drought will officially be over for the Bronx. Last weekend’s snowstorm already ended the drought in Brooklyn. A period of sunny skies and seasonably chilly air lasts Thursday through Monday. All that cold air creates a problem for next week. Tuesday looks interesting. A nor’easter type storm has been on the maps for 3 days now, on both global models, and it’s not going away. Tuesday will be one to watch. Similar to Blizzard 2016, a 50 mile difference will make or break the forecast of a 2,000 mile wide storm. Considering the future storm’s energy is currently over the Bering Sea, off the coast of Russia, we have a while to watch and wait. Steady rain continues through Wednesday evening with a chance of scattered showers through the late night and overnight hours. As of the early Wednesday evening rainfall amounts were approaching .50 inch with another .25 to .50 inch possible by early Thursday morning. Temperatures were 14 to 17 degrees above average on the day with cooler and drier weather in the forecast as we close in on the weekend. This week’s weather is very similar to typical early March. (You know how it can be 70° and sunny one day, then snow on the ground the next? That’s basically it.) While the rapid and wild swings are tamed this weekend by persistent cold air, anticipate a little surprise snow tomorrow. Once the sunshine returns by 10am this morning, the lingering clouds and fog will lift. Midday sunshine today will keep highs in the low 50s today. Clouds return later this afternoon with colder air and another round of light showers this evening. (It’s actually the same rain from yesterday, just backing up for another visit). Tonight’s rain lingers long enough that it meets the cold air and becomes snow around 3am. Light snow lingers through 7am tomorrow, leaving an slushy/icy coating on the cars tomorrow morning. No more than one inch. Any accumulation begins to melt with full sunshine returning by 10am Friday. The roads are even dry by 3pm when the weekend getaway begins. Cold and sunny weather remain through Sunday afternoon. Monday afternoon into Tuesday’s storm is still there, but it’s unclear how much it affects our weather. Still, planning on some snow. An overcast sky was with us for most of our Thursday with temperatures 19 to 21 degrees above average. We’ll keep the clouds overnight with showers moving in late as rain rides along a cold front. Temperatures will cool to the low 30s overnight which means that the rain showers will chance to a wintry mix of rain and sleet before changing to a steady, light to moderate snowfall starting between 2am and 3am. As a result, the National Weather Service has issued a WINTER WEATHER ADVISORY from 1AM to 12PM Friday. 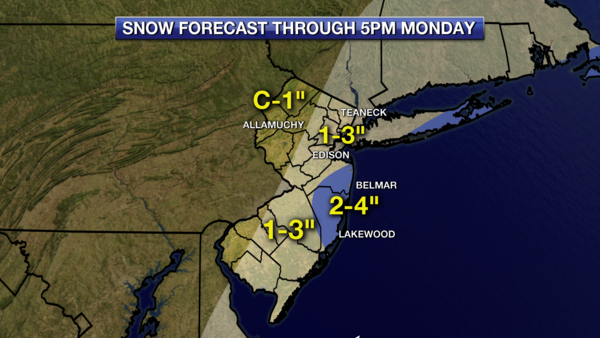 Snowfall Estimates: 3 to 5 inches with the potential for isolated higher amounts. Visibility: ½ mile. North winds 10 to 20 mph with potential gust of 30 mph. The snowfall this morning is the clingy kind that not only sticks easily to powerlines and tree branches, but also makes great snowballs. Snowfall intensity reaches one inch per hour until 9am, then begins to taper and become fluffier as noon approaches. Multiple lightning strikes offshore show how much energy today’s storm has, also aided by a warmer than average ocean (12° warmer than average for the date). Snow ends at noon, accumulating to a heavy, water-logged 3-4 inches. Higher elevations may have up to 6” by noon. Sunshine returns by 2:30pm. Watch for falling globs of snow this afternoon as sunshine loosens and melts it from the treetops; otherwise, it’s great sledding weather later today. The colder afternoon and evening freezes everything in place in the upper 20s tonight. Tomorrow and Sunday are clear and seasonably cold. Next round of snow arrives on Tuesday. That could also provide accumulation. Specific details: TBD. It was a mess start to our Friday as heavy, wet snow fell across the boroughs. Snowfall amounts ranged from 2.5 to 4.6 inches. Thanks to a mostly sunny afternoon and highs in the mid to upper 40s, most of the snow has melted. This leaves the potential for icy spots as overnight lows fall to the upper 20s to low 30s. Our weekend weather looks pleasant under a partly to mostly sunny sky and highs reaching the mid-40s for Saturday and Sunday. We’re still watching for a potential coastal storm early next week. At this time, it looks like the low will be far enough off the coast that we may only get a light snowfall Monday into Tuesday. We’ll keep you posted. Have a safe and pleasant weekend. Tomorrow morning's accumulations beginning at 7am and ending at 5pm will be 1-3". This is a multi part storm that gives us up to 8" through Wednesday. There will be a light snowfall for 72 hours--not that much when you consider that it's over the entire time span. Tomorrow's snowfall will be a similar depth as Friday, but a different consistency: light and fluffy, as opposed heavy and waterlogged. if there's a dramatic change (up to 5"), we wouldn't know until 4am tomorrow. Details of parts 2 and 3 of this multi-day event (for Tuesday and Wednesday) will be determined tomorrow. Light snow begins falling after daybreak this morning, accumulating to just an inch or two by this afternoon. Most accumulation is over by this evening’s rush. Flurries return after dusk, adding an additional half inch to today’s totals. Tomorrow starts cloudy, then brings back round 2 of snowfall tomorrow evening. Similarly, tomorrow night’s and Wednesday morning’s snowfall should amount to less than 4” (separate from what falls today). I’ll provide but additional details tomorrow. The coldest air in a year arrives Thursday, and becomes coldest on Saturday when the wind chill will be -12°F. Sunday starts warmer at -11°F. Actual lows will be in the single digits rivaling lows from last February when they hit 2°F on 2/20/15. Weekend highs won’t leave the low 20s. Bitter winds start Thursday, lasting though the weekend. We’re going into the second week of February under wintry conditions. We were 1 to 2 degrees above average for the day with snowfall amounts from 1 to 2 inches. Snow flurries and snow showers will remain in the forecast through mid-week as well as a blast of Arctic air that will give us highs in the 20s and 30s with overnight lows in the teens and single digits Thursday through Sunday. Once again, areas of black ice may be encountered. accumulations anywhere from 2-3 inches. Temperatures were 2 to 3 degrees below average with a trace of snow for Tuesday. We’ll get another round of snow this evening beginning as flurries and building to a light steady snowfall late tonight. Snowfall estimates from 1 to 3 inches can be expected by midday Wednesday. Don’t forget that we have an Arctic air mass heading in our direction. This bitterly cold air will give is highs in the teens and twenties, while overnight lows fall to the single digits and teens from Friday through Sunday. The National Weather Service has issued a WINTER WEATHER ADVISORY until 12PM Wednesday. Periods of snow will begin between 6PM and 7Am this evening. Snowfall potential from 2 to 3 inches by Wednesday morning. A COASTAL FLOOD ADVISORY has been issued from 10PM tonight through 1AM Wednesday for the Bronx and 8PM through 11PM tonight for Brooklyn. Not necessarily in that order, today starts with clouds and another round of flurries in Brooklyn. Sunny breaks appear by this afternoon, helping highs warm into the upper 30s for the last time until Monday. Colder air begins to slide in tonight, bringing yet more flurries for the Bronx. Tomorrow starts noticeably windy, with temperatures dropping throughout the day, and still, another chance for a flurry burst. The wind chill on Friday will be near zero. 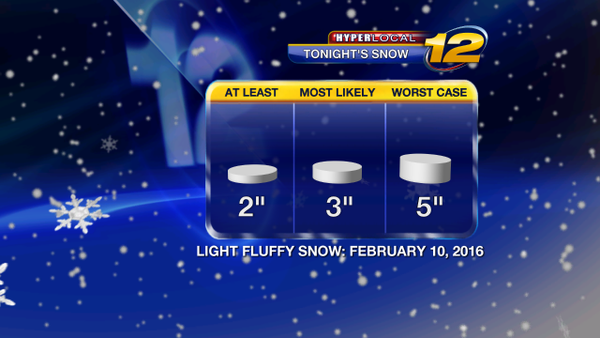 Any of these flurry events leave a dusting of accumulation at worst. Saturday and Sunday will likely set new record minimum highs, meaning that the afternoon high was never that cold on that particular day. The forecast high is 16° for Sunday with that morning’s wind chill to be about -26°. Monday’s temperature quickly moderates to average, around 40, with another threat for snow on Tuesday. This weekend’s weather just keeps getting colder. Actual air temps on Sunday morning may set new record lows. The St. Valentine’s Day record is 2°F set 100 years ago. There were only 5 airports in the world then, so the oldest records in the area are found in Central Park. Today’s weather is similar to yesterday, just 10 degrees colder and windier: sun is followed by flurries, with gusty winds to 35mph all day. Tomorrow is clear, and the weekend is brutally cold with wind chills below zero most of Saturday and Sunday. Monday night has another storm creeping up the coast, but the track is highly dependent on precip type. Today, it looks like a snow to sleet storm beginning late Monday night and lasting through Wednesday. Considering how cold the air gets this weekend, it will be hard to mix in rain. More details tomorrow and this weekend. Sunday morning will feel three times colder than this morning. Winds will be howling all weekend, with Wind Chill Advisories effective beginning tomorrow at 4pm, lasting until noon Sunday. The last time a wind chill advisory was issued was last January for NYC; however, in the last 30 years, the city has never been placed under a Wind Chill Warning. We come pretty close to that criteria late tomorrow night. Get this: it will be so cold, that the lower levels of the atmosphere will be compressed by a few miles, due to the density of the cold air. That means there will be less distance between us and space. End result, we’re closer to outer space. This Arctic assault could essentially be described as “out of this world”. Records will be set/tied by 7am Sunday. Monday evening’s snow quickly turns to sleet, then rain as the storm moves far enough inland to support an all-liquid event for Tuesday. Highs could reach the upper 50s on Tuesday afternoon. Yesterday’s record low of -1° will keep roads and sidewalks frozen through this afternoon’s snow. Light snow begins around noon. Most of the snow changes to sleet by 7pm, with a quick changeover to rain. Any accumulations shouldn’t be more than an inch or two by this evening’s changeover. Thanks to the moderate rain and mild air that follows, don’t bother picking up the shovel: even where the rain doesn’t fall, air temperatures in the upper 50s tomorrow with wind, melt any leftover frozen areas. Tomorrow morning and early afternoon with be cloudy, mild and windy, with spotty sprinkles. After 3pm, a line of spring-like thunderstorms brings briefly heavy rain and gusty winds, helping to cool the temperature back down to average. Sunshine follows for the rest of the week. This morning’s very mild weather arrived too late to hold off glazing due to freezing rain. The dense, cold air wouldn’t budge in some spots of the area, creating ice on just about everything until 4am. Then, muggy, mild air blew in to help melt away most of the icy crust. Additional melting occurs this morning as temperatures jumped from 33 to 50 degrees in 3 hours. Drizzle and fog will be the predominant weather this morning, followed by downpours beginning this afternoon. Any heavy rain may be accompanied by a rumble of thunder. Heavy rain clears out this evening, followed by chilly breezes overnight, dropping the temperature back into the upper 30s. Tomorrow begins dry and sunny. Seasonably chilly weather with sunshine remains through Friday. Late Friday night into Saturday morning brings back the threat of freezing rain, with clearing by Saturday afternoon. The weather stays active into next week with a system to watch mid-week. The quiet weather trend until Tuesday of next week, begins today. Pleasantly dry weather with sunshine is accompanied by a seasonable chill through this afternoon. At times, more clouds may fill the sky versus sun. This is normal, since yesterday’s storm left some upper-air energy behind—that energy is what spins through the skies today, creating the clouds. Tomorrow and Friday’s weather will be exceptional. Other than chilly mornings, with wind chills in the teens, the afternoon warmups will feel milder than average. A spring-like weekend returns as highs climb into the upper 50s on Saturday, lower 50s Sunday. Monday’s weather is still quiet with sunshine. By Tuesday, all eyes will be on a large coastal storm that will impact the area with a variety of effects beginning Wednesday. It could be any or all of: snow, ice, wind, flood, etc. I’ll know more this weekend. Sunshine and active winds with highs 2 to 4 degrees below average for the day. High pressure over the eastern Great Lakes region will move southeast generating a south to southwest flow that will bump our temperatures to the 50s for daytime highs from Saturday through Monday of next week. Low pressure currently over Montana will move east along the US / Canadian border and bring clouds to the region to close out the work and school week. Weather for the next 4 days will be wacky. It’s a pattern very typical of early March. Notice how the sun rises by 6:30am and sets much later? Longer daylight hours means more energy for bigger weather swings. This morning starts just as cold and clear as yesterday with less wind. The afternoon will quickly turn cloudy as light sprinkles try to fall, but mostly evaporate before reaching the ground. You might get a few drops on your windshield around 3pm. The light winds will make today’s 40° high feel much colder under the overcast skies. Clouds clear out before daybreak tomorrow, but despite all the sunshine, SW winds are responsible for mid-50s tomorrow. Sunday starts with a sunny morning, but cloudy skies return for the afternoon, leading to a winter event Sunday night. A fast moving storm system riding a 170mph jet stream zips by beginning Sunday evening, and ending just after the morning rush on Monday. Rain turns to snow Sunday night and may accumulate enough to make roads slippery by Monday morning. 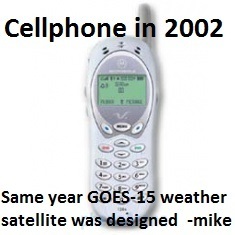 Due to its small areal size, this system was overlooked by the global weather models simply because the resolution wasn’t high enough to notice it. Higher resolution regional modeling through Monday was available starting last night. Also, that famous global European model is receiving a huge resolution upgrade to that is similar to the nearer-term regional hi-res models. It too, agrees that rain/snow is likely Sunday night. The large scale Wednesday storm is still on the maps, but will likely be a coastal flooding event with seawater storm surge (full moon is Thursday) if the winds are correct..
After a day with increasing clouds and temperatures 5 to 6 degrees below average, we’ll see a rise in temperatures after midnight thanks to southerly winds and an overcast sky. It’s the southerly winds and increasing sunshine on Saturday that will bring a return to pleasant weather as we go through much of the weekend. Clouds return by Sunday afternoon with the potential for a mix of rain and snow late Sunday night into Monday morning. With forecast highs in the mid-40s for Monday, any mixing should turn to rain before ending during the late morning / early afternoon hours.